Keeping Up With The Souths: "Bad Guys! 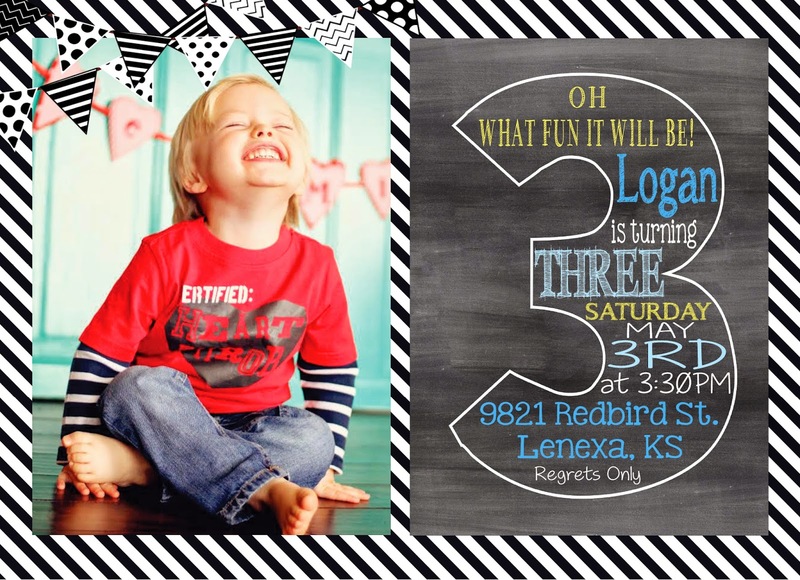 MOM"
A few months back we started talking about Logan turning three and of course that brought up questions about his birthday party and what theme we would do. Each of their past parties have had themes in which they were into--ie. TMNT, dinosaurs, trucks and so forth but I also made HEAVY suggestions on what those themes would be. 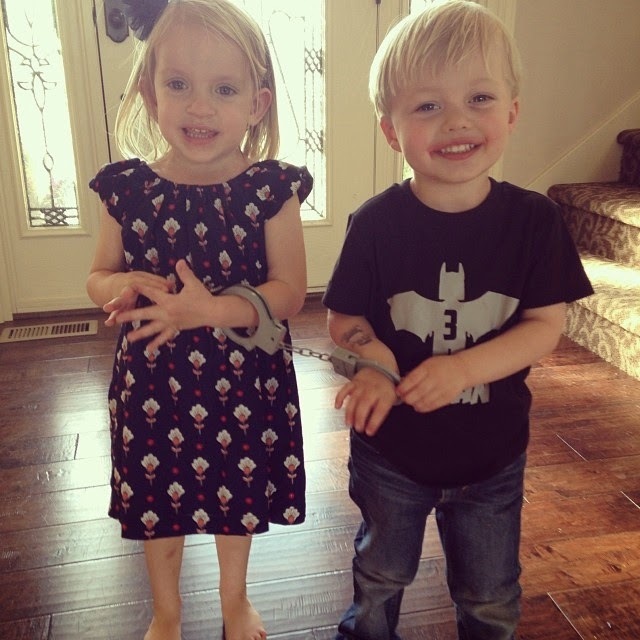 This time, Justin said not to give Logan any ideas or hints and to let him choose all by himself. I was a little worried---he could have said snakes. He could have said "Mom, I want Fast Shoes". Rain. Squinkies. Sandwiches. There really was no telling with this kid, he could have gone in any direction but he didn't. He went with one of his favorite pastimes--Chasing Bad Guys. Yes, he wanted a Bad Guys birthday party. He loves "getting" the bad guys. He and Kaden are always the good guys that are chasing, capturing and hauling off to jail the bad guys. 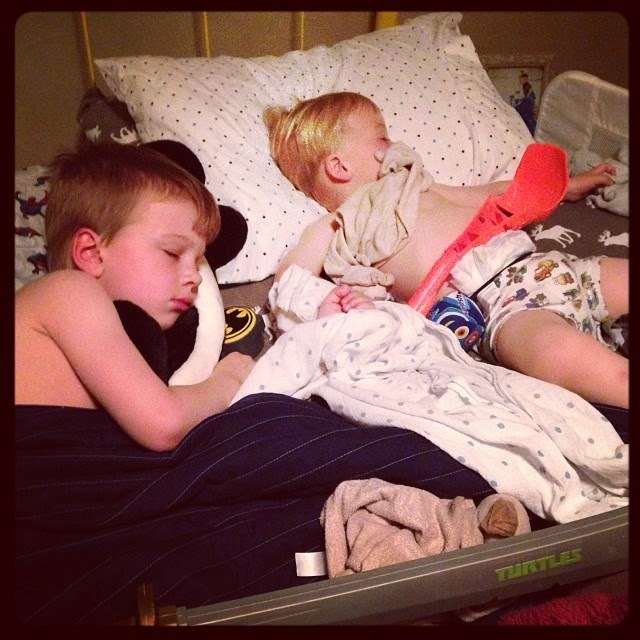 Logan often takes his Captain America shield or his pirate sword to bed just in case the bad guys decide to try and sneak up on him. & what I figured would be a one time proclamation, wasn't. 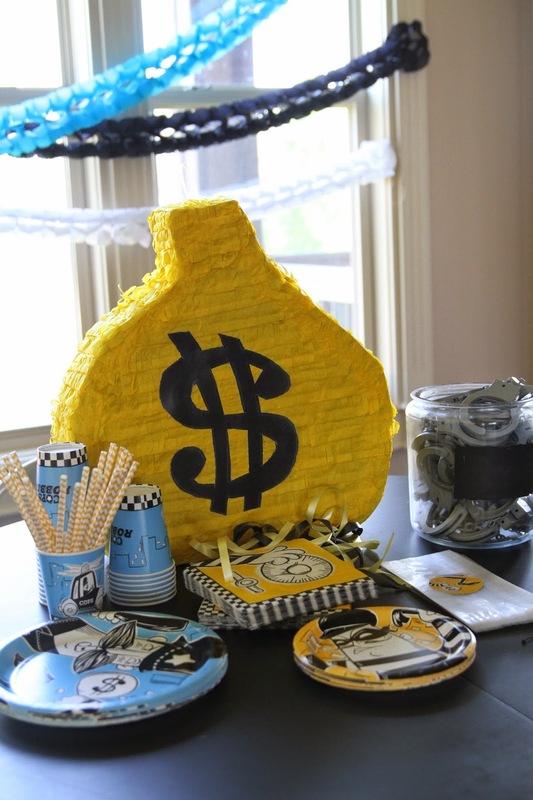 Every time he was asked about his party it was the same answer--Bad Guys Party. & Bad Guys Party he got. 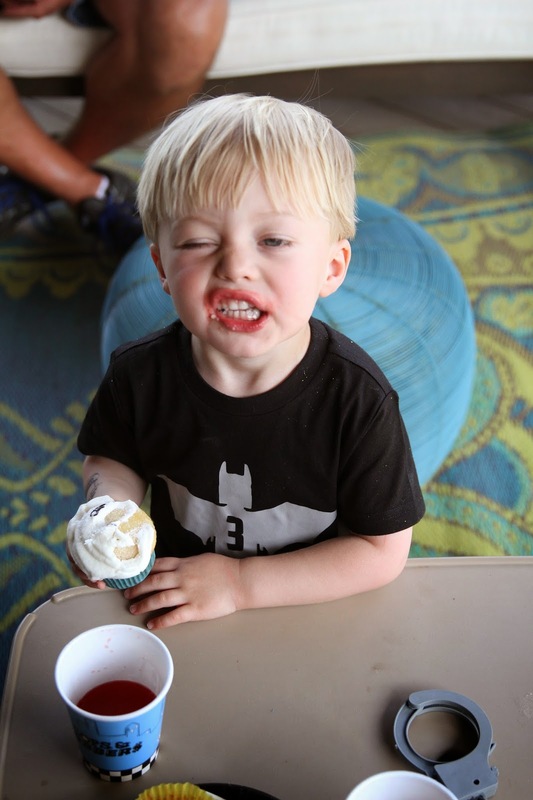 Thankfully there were a few moms and dads who had already thrown a "bad guys" birthday party--they referred to it as Cops and Robbers though. & lucky for me, the pinned their ideas and I just recycled them. I did more buying of decorations this year than I have for parties in the past--I wasn't really in the mood to create or cut out my own, nor did I have enough time to do this. We decided to do a sweets table & do minimal food in hopes of getting everyone's kids on the biggest sugar high EVER and then sending them home with their parents for what was destined to be a fun bedtime routine. 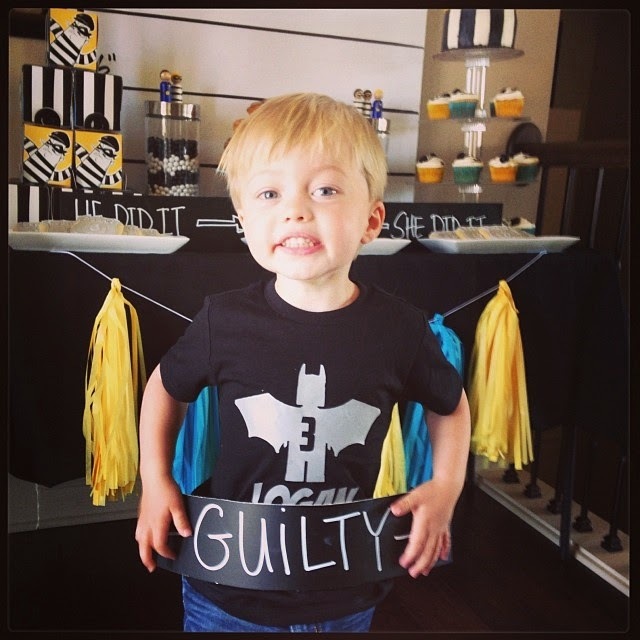 Like Logan's second birthday, I reached out to Birthday Couture for another personalized shirt to go with the theme. Logan's favorite Superhero is Batman so I thought this grey on black shirt would do the job perfectly. I mean seriously, have you laid eyes on a cuter kid?!? He of course couldn't just stand there, no if he was going to stand still for me, then I had to let him climb and do the picture that he wanted too. I happily obliged. 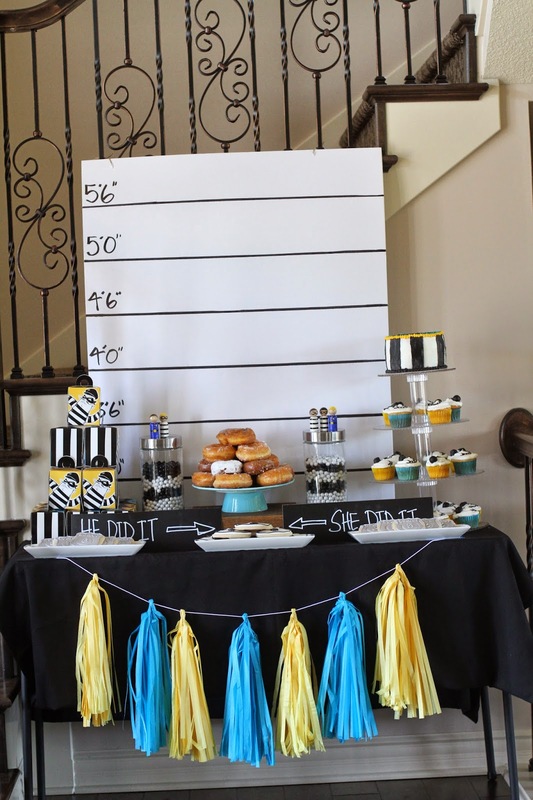 A number of the decorations-plates, cups, napkins, cupcake boxes, stickers, tattoos & pinata were all purchased from Birthday Party Express online & although the mugshot background and the He Did It and She Did It signs could also be purchased there--I ended up making these and saved money. These little cuties came from Zooble on Etsy. This shop has the cutest little wooden dolls for any occasion and I love how they remind me of some of my favorite toys growing up. When it came to the donuts there was only one place we could even think about getting them from--John Space Age Donuts in Overland Park. Moving out West has required us to rethink some of our favorite restaurants but it could never change our mind on John's donuts. The one original idea I had came in the form of Logan's "smash cake". & I call it a smash cake not because we let him dig into it like a one year old would but because it is the size of a smash cake. 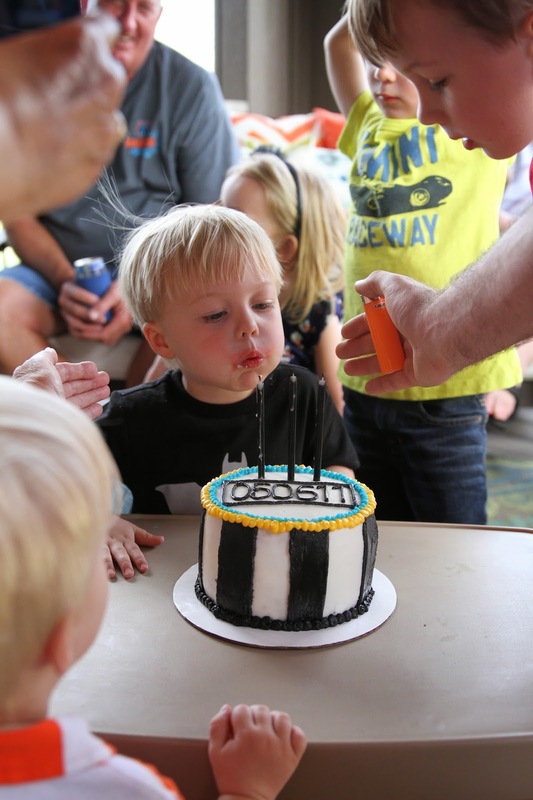 We actually use this cake when it comes to blowing out the candles but then wrap it back up and place it in the fridge for his actual birthday--May 6th. We will sing Happy Birthday to him again, let him blow the candles out again & then we will eat cake again. The cake and cupcakes came from MoMo Roo and Shanna is our go to when it comes to cakes, cupcakes and cake pops--check her out, she won't disappoint. In fact, my mother was a little upset that I didn't have cake pops this time around & told me I better not celebrate another birthday without them & she's right, they are delicious. 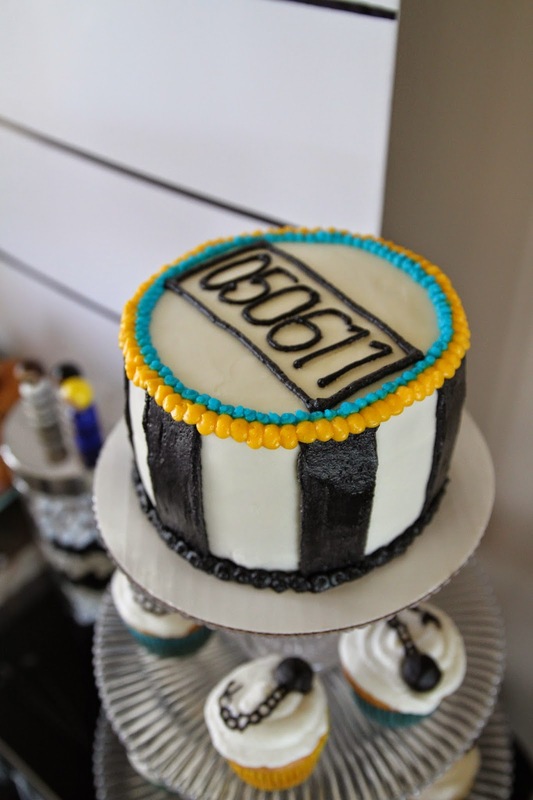 Anyways, my one original idea for this party came in the form of Logan's "prisoner number" on his cake, his DOB. Last but not least & certainly as tasty as all the other sweet treats are these adorable cookies. I had reached out on Facebook for suggestions for cookies and so many people were raving about Icings by Ang and they were right, delicious. I can't stop eating them. Finally, it was party time and the house started to fill with friends & family. 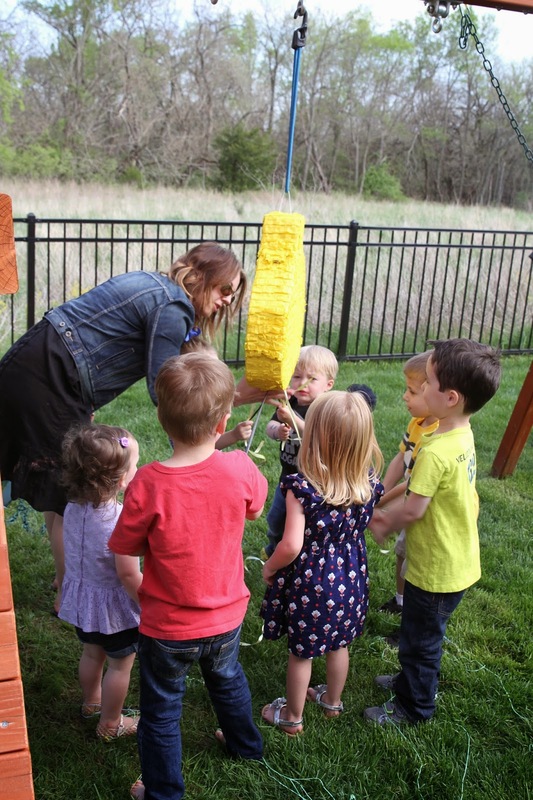 We borrowed a friends' bounce house which is always a hit--no matter what age! We played Pin the Mask on the Bad Guy which I actually drew myself and trust me, I am not an artist and what may be simple for most certainly was not for me. 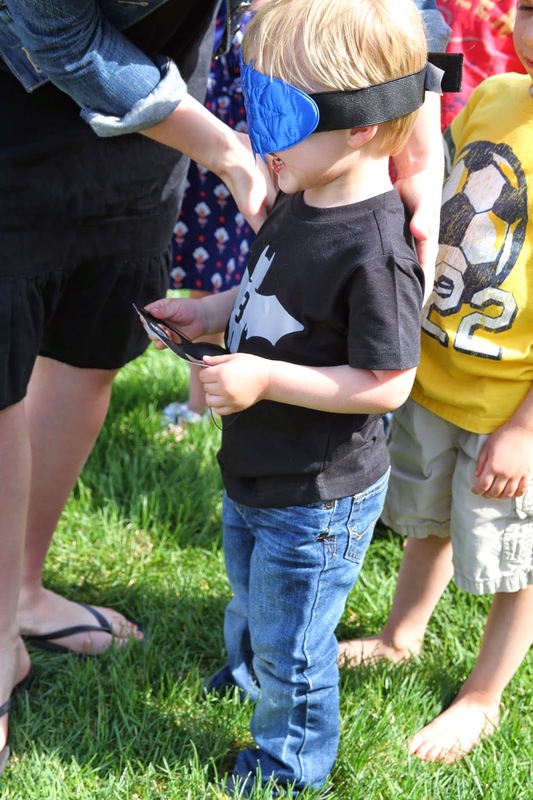 And when it came time for the actual game, it took a couple of attempts to get the blindfold to work properly, a few kiddos figured out how to "peek" by looking up but it was a valid first attempt at games for a three year old. And why stop the sugar high. We went straight into cake and presents. We started off with trying to light the candles which took more people than we would like to admit and once they were lit, they were blown out -- but by the wrong birthday boy, Cousin Colton was just practicing for his party this coming weekend. No biggie--we just lit them again and sang one more time. About halfway through Logan just went for it. He had been patient enough. Finally it was present time. 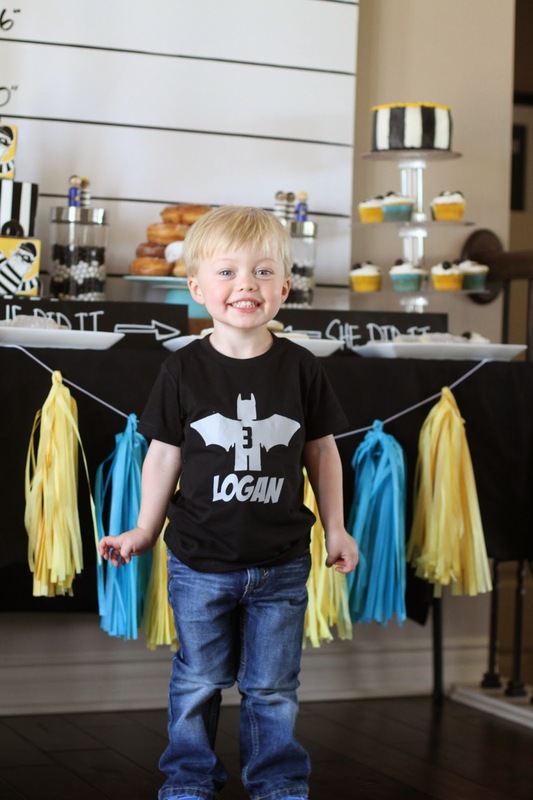 Logan had been waiting for this part all party long. This was actually his first experience with opening birthday gifts since last year we did book donations to Operation Breakthough. This year we are doing things a little differently, we are letting him have a few gifts at his party and then he and I will spend his birthday stocking up on toothbrushes and toothpastes and delivery them to the boys and girls at Operation Breakthrough. I am not one to point out favorites but unfortunately when it came to presents, there was no denying which one was his favorite, he hasn't put it down. You see that Leonardo sword, yup, hasn't left his side yet. It sleeps with him. He eats breakfast with it. He even takes it into the bathroom so Kaden won't take it away. Thanks Jennifer, Jake and Nathan--you hit a home run. Kaden's favorite toy. The Batman flying spinner thingy from Grandma Sara and Papa Tom. He also sleeps with it and takes it everywhere. I think Kaden was just as excited for all of Logan's new toys as Logan was. And as quickly as it started, it ended too. One by one friends said good-bye and wished this little man a happy birthday. He was especially sad to see Sophie go but she was quick to remind him that she would see him at Brenda's in just a few short days. And after everyone was gone and the house was quiet both boys finally passed out. But not before playing musical rooms. They started the night out in Logan's room on the floor before moving to Kaden's room on the floor and finally climbing up on Kaden's bed and settling in next to each other. As you can see, Batman and Leo's sword are right there in a hands reach. Thank you to everyone who came out and celebrated with us. It is so refreshing to look around the house and see so many of our favorite people. 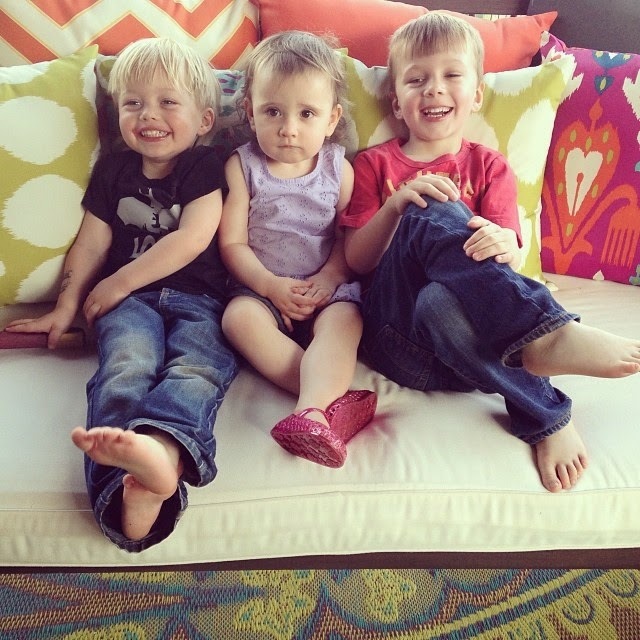 To see our kids playing with our friends' kids, all growing up together. To hear nonstop laughter & squeals. We are so very blessed and lucky to have such a wonderful village.